Each frame is .1 second apart. At this stage of the race, Brooke Bennett is swimming at a consistent 2:07 for 200 m pace, a pace similar to that demonstrated in her other analysis at 215 m.
The qualities of Brooke Bennett's stroke at this stage of the race are similar to those described in the 215 m analysis. Frames #2, #7, and #18 show the conservation of momentum that is possible with this type of stroke. As one arm is nearing completion of propulsion the other commences. This results in an almost constant propulsive force and a reduction in inertial lags that comes from distinct-cycle strokes. This promotes less required force early in the stroke as well as less of a requirement to accelerate markedly during the propulsive phase. These two attributes have direct effects on efficiency and fatigue. On face value, this type of stroke is ideal for distance swimming. The breathing action causes stroke shortening. When the position of the just-entered arm is compared to the position of the propulsive arm, this effect is noticeable. The relative hand positions in frames #7 and #18 should be compared. In frame #7 the right arm has entered and is holding the water, a state inferred from an absence of bubbles following the hand and forearm. The left arm is extended backward and deep, the left leg is kicking, and the head is down. In frame #18, a phase of the stroke that is as close as possible to that depicted in frame #7, there are some subtle, but important, stroke features. The right arm is not holding the water as effectively, the trailing bubbles on the arm indicating a notable degree of cavitation. The head is higher than in frame #7 which probably contributes to the lower left leg (the knee is deeper) and an overall larger kick. Streamline is less in #18 than #7. The right arm is further along in the stroke relative to the left arm than in frame #7. These factors contribute to a shorter stroke being performed after breathing than after a non-breathing stroke. The high stroke rating, each arm stroke averaging less than .6 seconds, allows only two kicks to be performed. Those kicks are quite large. The size of the kicks restricts the opportunity for the hips to rotate. In all strokes, shoulder rotation is greater than hip rotation, a feature which does not produce the least frontal resistance. The extension part of the propulsive phase of both strokes places the hand and forearm under the swimmer's body. This is a feature that was also depicted in Michelle Smith's stroke. 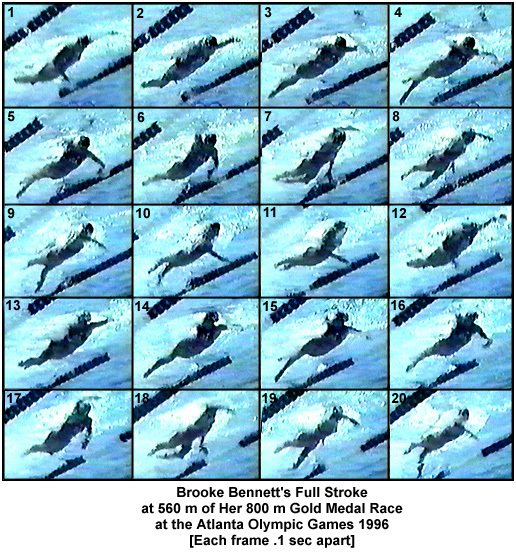 The "elbow-up" position, achieved well in front of the swimmer with both arms, indicates that Brooke Bennett performs a long effective propulsive stroke. The directness of the stroke, its being horizontal and oriented to being under the swimmer, minimizes lateral forces which would only increase active drag. The swimmer swims "over" her arms. Streamline in a non-breathing stroke (frames #1 to #8) is better and more obvious than in a breathing stroke (frames #11 to #17). The degree of curvature in the back is the primary distinguishing characteristic that illustrates the difference.